In October I said I'd be rebooting the long-term vision for GOV.UK. You can see it as a presentation (on Slideshare and in PDF), this blog post and a set of posters. If you work in government please share it with your colleagues. There's never been a better time to be part of this revolution and we're hiring. We're posting more jobs all the time, so keep checking or say hi and introduce yourself. The original vision for GOV.UK was a rallying cry which set a very clear direction: consolidate thousands of domains into one, with a focus on user needs and continuous improvement - creating the GOV.UK we have today. While GOV.UK has become the best place to find most government services and information, and is now an essential part of UK national infrastructure, it’s far from the best place it can be. There’s much more to do to bring government’s web estate together, merge content and transactions to form coherent services, and curate them to meet users’ real needs. GOV.UK must be a constant revolution. We need an equally clear direction for everyone whose work contributes to its ongoing development. and gathered ideas from more than 150 people inside and outside government, to create this refreshed vision. It’s not a plan for delivery, but describes an ideal future GOV.UK that we will iterate towards. It refers to the GOV.UK website, publishing platform, all government content and the ways in which those things integrate with transactions and offline help to form a unified user experience. It’s relevant to everyone whose work contributes to that user experience - from teams in GDS to service and content owners throughout government. 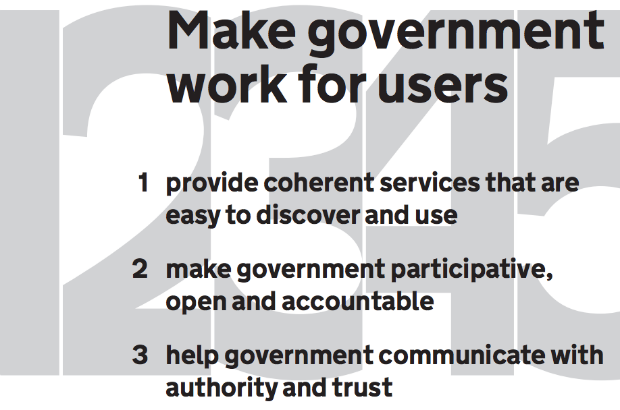 The renewed vision for GOV.UK is "to make government work for users". It’s an ambition which reflects the power and potential of GOV.UK. As the interface between users and government, GOV.UK has enormous potential to close the gap between them. It can make every user’s need heard within government, help government meet those needs in the most convenient way possible, and make government more accessible and accountable to its users. Having brought government together, we now need to make government work for users. We’ve distilled thousands of ideas about what GOV.UK should become into 5 statements, all of which need to be true to make government work for users. This vision will guide our plans as GOV.UK develops. Big changes will be taken forward as projects, and we'll iterate towards these statements in small ways all the time. To see what we’re working on and planning, subscribe to this blog. I'll post again in a few weeks to talk about how we'll start moving toward this vision in terms of priorities for the coming year. This sounds great. Two caveats. .GOV.UK really needs to get its act together on fact-checking, which has been awful. I don't know the exact chains of responsibility, but alongside the 'death of context' issues, this has really alienated specialist users. And the public are misinformed. On HTML vs PDF. It should be remembered that the web is writ in water, whereas PDFs (notwithstanding their evident disadvantages) are mine to keep. If HTML is to replace PDF there should be a policy of no deletions (except in exceptional circumstances, with grounds made public), Every version of every published page should be maintained and publically visible (with appropriate status tags). There should be a formal framework (registration, versioning, signing etc) for this. Hi Tim - yes I agree fully. Current thinking is that we will provide a full, public version history of every change to web content, and that our publication formats will output to whatever portable formats people need (PDF, ePUB etc) but be natively HTML, so they work on every device, are future-proof, syntactically structured hypertext. PDFs will have a role, but shouldn't be the only or the native format of the source content. All sounds good. But I just can't tell what's changed - can you explain? The focus of the original vision, which has guided our work over the last 4 years, was all about replacing a sprawling landscape of thousands of domains with one. So this vision starts from the point where we've done that and looks at how we build on it. While there's lots in here which carries forward things in the original vision (like 'going wholesale' with APIs) there's also loads in this that we've never said before (the bits about journeys to the whole state not just central gov, our aspirations about democratic transparency and participation, and about transforming government publishing models, for example). But what does "it will: provide digital representations of real world things, backed by registers" mean? Apologies this wasn't clear. This means things like a page for every country, local authority, government building, school, river, court, prison (and potentially house, vehicle) combining data from multiple registers (eg, for a property, information about its boundary from Land Registry, flood risk from Environment Agency, council tax band from Valuation Office Agency) - see http://www.openregister.org/ for more info.